Take Advantage of the Best Bachelorette Party Packages in Central PA! Why should guys have all the fun? Today, ladies celebrate weddings with bachelorette parties that take them to the hottest spots throughout the central PA region. From wine tours to night clubs to upscale eateries, any destination that offers fun, excitement and memories is ideal for the bachelorette and her entourage! But who wants to drive to and from the party? 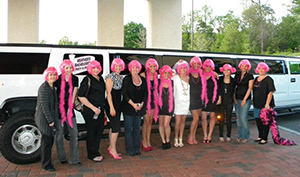 Instead, hire a bachelorette party limo from Premiere #1 Limousine Service. There are tons of options available thanks to our bachelorette party packages in central PA. We can help you design the party that’s hashtag and selfie worthy! We can even give you vehicle options, such as a bachelorette party bus if you have a large group heading out for a pre-wedding celebration. Contact us at our Middletown, PA, location at (717) 616-8995 to book your bachelorette limo right away. You can also fill out our convenient form, and make your reservation right from your laptop, smartphone or tablet. One of the biggest drawbacks to bachelorette parties is having to elect a designated driver. Certainly, this is the safe and correct thing to do, but that person may not enjoy being the only one who cannot fully participate in the celebration. Plus, because the designated driver is not a chauffeur by profession, she is unlikely to know the secret routes to get to all the hotspots as fast as possible. Instead of forcing one of the bachelorette partygoers to be the chauffeur for the night, hire a real chauffeur with a luxurious limo or other vehicle! Our Premiere #1 Limousine Service vehicles guarantee a smooth ride, and you’ll be thrilled by their condition inside and out. Bachelorettes and their BFFs throughout the Susquehanna Valley rave about the cleanliness and amenities of our bachelorette party limos. We know you’ll be equally as pleased. To discuss your upcoming bachelorette party plans, please call our team at (717) 616-8995. We’re happy to explain all the options available to make your night out nothing short of spectacular! Aside from hiring a private limo from Premiere #1 Limousine Service, you can make your bachelorette party the talk of social media by having a planned list of places you want to go. We can help you decide on the best places, especially if you’re from out-of-town and are organizing the bachelorette party by yourself! Remember that we all live and work in the central PA region, so we know the best restaurants, bars and more for bachelorette parties! Contact us today to make your reservation!